Emo de Medeiros, Vodunaut #002 (Hypercharger). Picture by Marcelrose, CC0. This paper inhabits the spaces of embodied knowledge and technology: more specifically, it focuses on techno-colonialism (a subset of neocolonialism that focuses on technology as means of delivery of neocolonialist practices) in international aid. 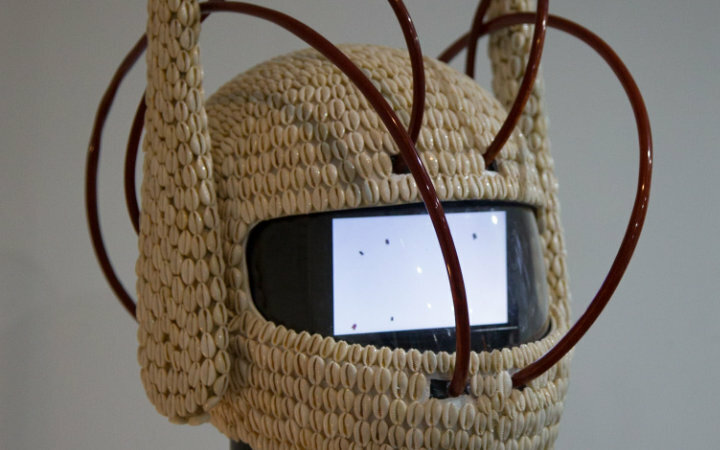 Through a techno-feminist analysis of the international aid’s relationship with digital identity simulacra, it proposes a way to subvert and disrupt techno-colonialist systems through re-situated technological artistic creation. Technology in development has been a hot topic since the 60s. Over the years it has undergone various strategies and approaches — each phase complicated the understanding and relationship further, learning from past experiences. From the adoption phase of the 60s, we transitioned into the transfer phase in the 70s and 80s, and then the innovation phase of the 90s. We’re currently struggling to understand how to strengthen embodied knowledge through learning and agency (Heeks and Stanforth 2015; Johnson and Andersen 2012). There is no doubt that technology can deliver, and has delivered on, some of its promises. From improved tracking of Ebola outbreaks thanks to big data analysis (Nieddu et al. 2017) to hacked solar-powered smartphones in rainforests that listen for sounds of chainsaws in order to report illegal logging (Cavanaugh 2018), technology in international aid does enable successes that were previously impossible. However, while there are benefits to a techno-colonialist model, they don’t challenge the underlying dichotomy of the model itself; a differentiation of the archetypes of “aid provider” and “aid recipient.” They are, in fact, incapable of challenging it because the model defines where creation is situated, and hard-codes the direction of the aid flow. This limits technological creation to a specific situated embodiment pertaining to the “aid provider,” and forces the “aid recipient” to inhabit an identity that’s been forced upon them. Defining identities is at the core of the techno-colonialist problem. The definitional space of international aid relies on a dichotomic relationship between the two identities of “aid provider” and “aid recipient,” and clearly prescribes the actors that have the power to define identities for the entire system. Those actors leverage data and technology to form digital simulacra of the ideal recipient, in order to more efficiently express their self-assigned role. In other words, the aid recipients are de-situated from their position, and re-situated into a decontextualized digital space of avatars and archetypes — a measurable, quantifiable, yet sanitised space, devoid of the complex actor systems that express the recipient’s becoming. Human conditions are intrinsically bound to the reality they inhabit: a sanitised digital avatar loses the situated complexity of performing in a system of human and non-human entities and artefacts it couldn't exist without, since an entity’s expression is a reflection of embodied affects towards objects it interacts with. This sanitised silicon simulacrum not only loses its situated systemic complexity — it also gains a new complexity from being situated within a network of digital and physical actors that don’t represent the reality of the recipient, but will significantly impact the reality of the simulacrum. For example, a database of aid recipients is in no way neutral or agnostic to its environment: its existence and expression are limited by multiple factors. The creative and inventive ability of the human who designed its information architecture will decide which information is kept, and which information is left out. The inherent limitation of data types to express anything other than what they are designed to express (a boolean will never mean “perhaps”) will constrict the information in machine-readable formats. The hardware that runs the database is limited by its own situated system of innumerable actors, from single CPU logic doors to memory allocation speeds. The human actants that operate on the database are limited in their analysis and insight by their own understanding of the database in particular, and technology in general. Even the networked mediators such as service provider routers and switches will manipulate the database’s expression. There is also a need to account for actively malicious actors, which might inhabit any of the mediating nodes without leaving tracks of their existence. If the database is algorithmically manipulated and analysed, for example through AI-based classification or automatic data visualisation dashboards, those abstract expressions of information will further remove the digital simulacrum from representing its real-life original. For a practical example of the perils of focusing on re-situated digital simulacra for aid development and planning, we can look back at the Ebola example. In “Ebola: A Big Data Disaster,” McDonald outlines a number of security and privacy risks that program designers and implementers ignored to achieve their definition of the greater good (McDonald 2016). This process of de-situating the physical and re-situating into digital simulacra means that designing and implementing aid relies on measuring and understanding a system that is far removed from its physical counterpart. This abstraction doesn’t necessarily mean consequences and impacts will always be worthless, negative, or downright dangerous: there are examples of this simulated project design providing concrete benefits to real life recipients — albeit not without issues (Currion 2018). However, we must ask ourselves what a non-simulated solution would be. While here I make the case that technology enables digital simulacra of identities, the process of avatarisation isn’t a byproduct of technology. Quantification and abstraction have led aid development and design as much as they lead statistics and demographics. The root problem, in my opinion, lies within the power dynamics of who is enacting the abstraction. The aid system is systemically incapable of providing a solution to this power imbalance because of the dichotomic relationship between aid providers and aid recipients. Technology further exacerbates the imbalance, by providing a veneer of agnosticity and efficiency that obfuscates the real-life impacts of the abstraction. Technology also supercharges the amount of information within digitally situated simulacra, by providing tools and resources for creating massively complex and information-rich avatars. This complexity is easy to confuse with veracity, and it is easy to falsely assume that, with more data and better technology, we can create incrementally more realistic simulacra. However, the de-situated nature of a digital simulacrum means that, no matter how information-rich or complex, it will always be an other with respect to the entity it is simulating (Suchman 2006) — unless we are able to painstakingly recreate not only the avatar itself, but the entire system of networks and actors that defines it. And no matter how advanced our technologies might become, the provider-receiver dichotomy will still dictate intent. To break away from the techno-colonialist dynamic of givers and given, agents and objects, actors and “acted upon,” I propose a two-fold stepping down strategy: relinquishing control, and re-situating technological creation. Relinquishing control is straightforward in concept, but extremely complex in implementation due to centuries of colonialist tendencies that have shaped today’s aid ecosystem. Without going too far out of scope for this short essay, there are real-life repercussions of a “pulling out” strategy that would severely impact the lives of multitudes, because such a systemically embedded expression of control has created a toxic culture of dependence. For this reason, the process of relinquishing control needs to be gradual: dependence needs to be consciously dismantled through a careful balance of risks and benefits. Re-situating technological creation means radically shifting the focus of creation onto persons that are currently defined as recipients: instead of enacting a one-way provision of services and products, re-situating requires positioning the embodied experience of creating technological artefacts fully inside their reality, to spark definition of meaning through art and speculation. The field of feminist technoscience draws a path through this concept: feminist technoscience analyses the irrevocable links between technology, science, and the politics of gender, race, diversity and otherness. Most importantly, it draws upon the concept of situated knowledge (Åsberg and Lykke 2010) which clues us in to the fundamental necessity of embedding techno-creation with and within the same people who will bear its results and impacts. Therefore, the most appropriate expression of technology will come from within the people intertwined with its politics, whose affects lie within the object space of its intervention, and who have a personal stake in its success. However, there is an infrastructural problem with re-situating technological creation. Technology isn’t monolithic — it is not a thing to give, or to take away. Technology is intertwined multiplicity — a multitude of human and non-human actors contributing to computation, creating and sharing information, and making mediated decisions (Heeks and Stanforth 2015). This multiplicity grew organically as an expression of intent and purpose of human and non-human actors within the network, and in order to recreate the same complexity there is a need to enable the same organic bottom-up growth. Aid providers are well positioned to support this growth, but cannot plan or design it: this multiplicity might be hard to observe from the perspective of the aid provider because they themselves are intrinsically networked, and are as much an expression of technology as it is an expression of them. A provider-based vision of what a recipient-owned infrastructure would become itself an ill-fitting simulacrum by automatically replicating its own existing relationship models. For a radically new and independent re-situation of technological creation, providers can initiate the birth and growth of a new infrastructural multiplicity by providing space and resources for technological creation — a recipient-led and recipient-owned creation situated outside the providers’ control, and not beholden to the providers’ needs, measurements or requirements. As Bishop shows in “Artificial Hells,” the act of artistic creation needs to be liberated from capitalist appropriation in order to retain its capability of producing original embodied knowledge (Bishop 2012). This freedom from value-added production is especially important in the spaces of technological creation, such as computational arts, physical and conceptual techno-artefacts, speculative narratives, or techno-mediated participatory happenings: if the desire is to create new technological paradigms, pre-assigning value to the effort means locking it within the space of pre-existing solutions (Geber 2018). Pure, “valueless” techno-artistic creation can lead to an organic growth of radically new technological infrastructures. For example, TZ’IJK is a “a robotic art installation composed of a community of blind, deaf and ‘dumb’ autonomous mobile agents ‘made with mud’ (Crembil and Adi 2015).” TZ’IJK’s creators traveled to the Peruvian Amazon to explore how the phenomenon of “mestizaje” can inspire “mestizo robotics,” a study in how technology is embodied, appropriated, transformed and assimilated in Latin America. In narrative speculation, Afrofuturism creates “speculative fiction that treats African-American themes and addresses African American concerns in the context of 20th-century technoculture (Yaszek 2006).” Beninese hypermedia artist Emo de Medeiros explores transculturalism and afroglobalism through the use of contextures, or “holistic and massively interconnected structures (Mann 2016).” During the Cold War, communist countries saw a flourishing community of DIY computer hardware makers that, unable or banned from purchasing original Western hardware, created homegrown personal computer such as the Romanian Cobra or the Yugoslav Galaksija (Fiscutean 2017; Lynch 2011). The examples above can serve as conceptual guideposts that show the potential in exploring re-situated techno-artistic creation. My wish is to see an ever-growing list of examples where “aid providers” choose to relinquish control, and create space for new technological multiplicities to organically grow within the spaces their creators, the “aid recipients,” inhabit. This stepping-down process has the opportunity to spark radically different concepts of innovation and technological advances, as well as to reduce the pressure exerted by techno-colonialism. “Africa: All-African Peoples’ Conference Statement on Neocolonialism | Pambazuka News.” n.d. Accessed March 27, 2018. https://www.pambazuka.org/global-south/africa-all-african-peoples-conference-statement-neocolonialism. Alemazung, Joy Asongazoh, and Others. 2010. “Post-Colonial Colonialism: An Analysis of International Factors and Actors Marring African Socio-Economic and Political Development.” The Journal of Pan African Studies 3 (10): 62–84. Åsberg, Cecilia, and Nina Lykke. 2010. “Feminist Technoscience Studies.” European Journal of Women’s Studies 17 (4). SAGE Publications Ltd: 299–305. Bishop, Claire. 2012. Artificial Hells: Participatory Art and the Politics of Spectatorship. Verso Books. Cavanaugh, Rachel. 2018. “Rainforest Connection Is Now Leveraging Machine Learning to Save Rainforests.” Digital Trends. Digital Trends. March 26, 2018. https://www.digitaltrends.com/outdoors/solar-powered-cell-phones-saving-amazon-rainforests/. Crembil, Gustavo, and Paula Gaetano Adi. 2015. “Mestizo Robotics.” Leonardo 50 (2). MIT Press: 132–37. Currion, Paul. 2018. “The Refugee Identity – Caribou Digital – Medium.” Medium. Caribou Digital. March 13, 2018. https://medium.com/caribou-digital/the-refugee-identity-bfc60654229a. Fiscutean, Andrada. 2017. “The Underground Story of Cobra, the 1980s’ Illicit Handmade Computer.” Ars Technica. November 1, 2017. https://arstechnica.com/gadgets/2017/11/the-underground-story-of-cobra-the-1980s-illicit-handmade-computer/. Geber, Tin. 2018. “The Social Worth of Art without Value.” Tin’s Uniblog. 2018. https://tingeber.github.io/uniblog/social-worth-art/. Heeks, Richard, and Carolyne Stanforth. 2015. “Technological Change in Developing Countries: Opening the Black Box of Process Using Actor–network Theory.” Development Studies Research 2 (1). Routledge: 33–50. Johnson, Bjørn Harold, and Allan Dahl Andersen. 2012. “Learning, Innovation and Inclusive Development.” http://vbn.aau.dk/files/70880770/Learning_Innovation_and_Inclusive_Development.pdf. Lynch, Lily. 2011. “Galaksija, Cult Yugoslav DIY Computer from the 1980s Lives on | BTURN.” B Turn. December 4, 2011. http://bturn.com/4614/galaksija-do-it-yourself-computer. Mann, Dave. 2016. “‘Contexture’ Is Key: An Interview with Hypermedia Artist Emo de Medeiros - Between 10 and 5.” Between 10 and 5. March 4, 2016. http://10and5.com/2016/03/04/contexture-is-key-an-interview-with-multimedia-artist-emo-de-medeiros/. McDonald, Sean Martin. 2016. “Ebola: A Big Data Disaster.” CIS Papers 2016 (1). https://cis-india.org/papers/ebola-a-big-data-disaster. Morozov, Evgeny. 2013. To Save Everything, Click Here: The Folly of Technological Solutionism. Public Affairs. Nieddu, Garrett T., Lora Billings, James H. Kaufman, Eric Forgoston, and Simone Bianco. 2017. “Extinction Pathways and Outbreak Vulnerability in a Stochastic Ebola Model.” Journal of the Royal Society, Interface / the Royal Society 14 (127). https://doi.org/10.1098/rsif.2016.0847. Sagoe, Cecil. 2012. “The Neo-Colonialism of Development Programs.” E-International Relations. August 12, 2012. http://www.e-ir.info/2012/08/12/the-neo-colonialism-of-development-programs/. Suchman, Lucy. 2006. “Figuring the Human in AI and Robotics.” In Human–Machine Reconfigurations, edited by Lucy Suchman, 2nd ed., 226–40. Cambridge: Cambridge University Press. UN Secretary-General’s Independent Expert Advisory Group on the Data Revolution for Sustainable Development. 2014. “A World That Counts: Mobilising the Data Revolution for Sustainable Development.” http://www.undatarevolution.org/wp-content/uploads/2014/11/A-World-That-Counts.pdf. Wai, Zubairu. 2014. “The Empire’s New Clothes: Africa, Liberal Interventionism and Contemporary World Order.” Review of African Political Economy 41 (142). Routledge: 483–99. Yaszek, Lisa. 2006. “Afrofuturism, Science Fiction, and the History of the Future.” Socialism and Democracy 20 (3). Routledge: 41–60.